Teleprompters Are A Practical Use Of An Old Illusionist’s Trick Known As? Leonard Nimoy Based The Vulcan Salute On A Symbol From Which Cultural Group? Pepper’s ghost is a rather clever illusion popularized by the scientist (and the namesake of the illusion) John Henry Pepper when he showcased it as a scientific demonstration in the early 1860s. The setup of the illusion is relatively simple, but the effect is quite spectacular. The heart of the illusion is the use of a sheet of glass (Plexiglas and plastic film also work) positioned at a 45 degree angle to the viewer (refer to the image here as we describe the effect). The viewer is positioned looking directly into the scene (the red square is the plane of their view) and the glass is cocked away from them (represented by the green square). The room behind the glass pane is lit up and the unseen room to the side of the audience’s view is kept unlit during the beginning of the illusion. 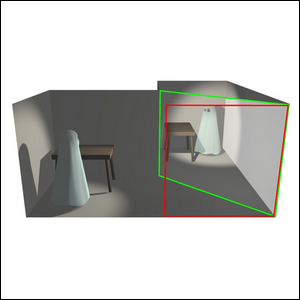 When the unseen room is lit up and the light in the seen room is slightly dimmed, the objects in the unseen room, like the ghost prop seen here, are reflected off the surface of the glass towards the audience, creating the illusion that a ghostly person or object has just appeared in that space. Not only has this illusion been used to great effect in haunted houses, carnivals, and even in performances (the appearance of Michael Jackson on stage at the 2014 Billboard Music Awards was a very high tech and well executed Pepper’s ghost illusion), it’s also got a very practical application: teleprompters. One element of the Pepper’s ghost illusion is that the reflection is only visible to the viewer in front of the pane of glass and not to anyone behind it (the same way that the reflection of a sunset off the windows of your home is visible to the people outside, but not to the people inside). In that way, a teleprompter can put text directly over the camera lens (so a news caster can read the news while looking right at the camera, for example), but the viewers at home never see the words.